Boiled crawfish in the springtime is a unique Louisiana custom. As spring bursts into the air and the weather warms up, crawfish come out of their burrows. We get a few short months of eating these freshwater crustaceans. I have several favorite recipes for cooking with crawfish. 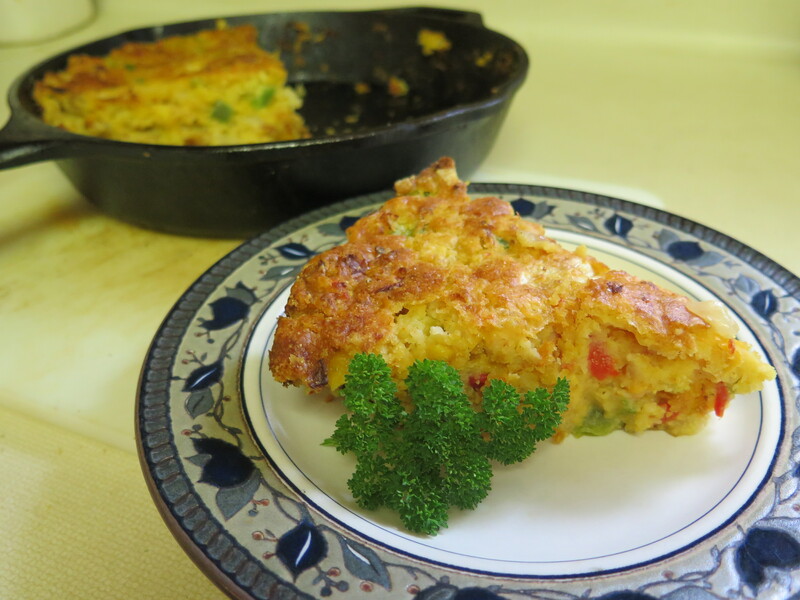 This recipe comes from Aunt Gaye who stated, “this is the best recipe I’ve seen in a long time.” The casserole reminds me of a spicy quiche, full of vegetables, cheese, cornbread and crawfish. My husband’s Aunt Gaye is an excellent cook. Occasionally she shares a recipe with me and I always take note. These are good recipes. Aunt Gaye sent me this one last fall and I’ve been waiting for a chance to try it. She’s right, it is an excellent dish. Just a little spicy; a touch of cornbread taste. I like all the vegetables and cheese in addition to the cornbread and crawfish in the recipe. The recipe was originally posted on Allrecipes.com named Crawfish Cornbread. (//allrecipes.com/recipe/213573/crawfish-cornbread/). This recipe does not have the texture of cornbread as originally named. It is more akin to cornbread stuffing or even quiche. So I renamed it a casserole. Secondly, Aunt Gaye substituted Jiffy Cornbread mix for the cornmeal. The cornbread mix has a finer corn flour texture than cornmeal. It also adds a slight sweetness. I used Martha White Sweet Yellow Cornbread and Muffin mix. Thirdly, we tweaked some of the ingredient quantities but essentially used most of the ingredients in the originally recipe. For a less spicy version, omit the jalapeno peppers and reduce the cayenne pepper to a pinch (or omit entirely). What if you don’t have crawfish? Crawfish tails can be a bit intimidating if you’ve never eaten them. But they are delicious–sort of a cross between shrimp and crabmeat. Give them a try. Crawfish tails have a wider distribution than in past years. Look for them in the frozen seafood section of large grocery stores chains such as Cosco’s. The recipe uses peeled and cooked crawfish tails; although partially cooked or even raw crawfish can be substituted. Here are peeled, cooked crawfish as purchased. Crawfish are often sold in 12 oz packages rather than 1 lb packages–either size can be used. I suggest not using Chinese crawfish — these have an entirely different taste. Because of labeling laws in the state, Louisiana crawfish will be identified as “a Louisiana product.” What if you don’t have crawfish available? You can still make the recipe. Substituting crabmeat gives a similar result. Small shrimp can be used–the taste is changed slightly. Ground sausage or hamburger can also be used–saute and cook these ingredients first. This recipe is very easy to mix up. Just mix all the ingredients and bake. Here are the ingredients. I baked the casserole in a 10″ cast iron skillet. A 9″x13″ baking dish can be used, too. Season the crawfish with the cayenne pepper, garlic powder and Tony Chachere’s Creole Seasoning (or seasoned salt). Mix all the ingredients except the cornbread in a large bowl. Aunt Gaye used one box of Jiffy Cornbead/Muffin mix which is an 8 oz box. For the Martha White family size cornbread mix, I used 1/2 box or 2 cups mix. Add the cornbread mix, pour into oiled casserole dish or cast iron skillet. Bake in a hot 375 degree oven for about 45 – 50 minutes until bubbly and browned and the sides start to pull away from the edges. This casserole baked for an hour. Probably a bit too long but still tasty. Preheat oven to 375 degrees. Oil a 9″x13″ casserole dish or 10″ cast iron skillet. In medium bowl, combine crawfish tales, Tony Chachere’s Creole Seasoning, garlic powder and cayenne pepper. Set side. In large bowl, combine onion, bell pepper, jalapeno pepper, diced pimentos, cream style corn, eggs, vegetable oil and cheddar cheese. Stir to combine. Add in the seasoned crawfish tails. Add the cornbread mix. Pour into oiled 9″ x 13″ casserole dish or oiled 10″ cast iron skillet. Bake at 375 degrees for 45 – 50 minutes until bubbly, browned on top and edges begin to pull away from sides of casserole dish. Remove from oven, let set on counter for 15 – 20 minutes, then cut into 6 slices and serve. This is really a meal-in-one. Serve with a side dish of coleslaw or salad. Enjoy! I made this recipe again using a box of Jiffy (8.5 oz) box of Corn Muffin Mix. I baked the casserole in a 10″ heavy cast iron skillet for 45 minutes. You could also use a 9″ x 13″ baking pan – both well oiled — may need to adjust baking time. This is a very soft casserole — it is not like a piece of cornbread. The key to getting the casserole to “firm up” is to let it set for 15 – 20 minutes after removing from the oven. It will still taste great if you eat it immediately, it will just sort of fall apart at the edges. I don’t mind, will your family? The azaleas are beautiful this spring. My favorite time of the year in Louisiana. A great place to live! This entry was posted in Louisiana Culture, Recipes and tagged crawfish, crawfish cornbread casserole by Maylee at Beyond Gumbo. Bookmark the permalink. Hello, You just add the dry Jiffy mix to the casserole– use an 8 oz box. You do not bake the cornbread first. The ingredients in the casserole have all the things to make the cornbread. Hope you enjoy the recipe, it is delicious! The “ Thibodeaux “ and “Boudreaux “ crawfish brand are Chinese products- not Louisiana crawfish. Thanks for this info; plus the packages are supposed to be marked “product of US” or not. I’ve never seen the Thibodeaux, but the Boudreaux brand is definitely Chinese. I hate when a product tries to fool people. I have seen some brands — such as Thibodeaux — market both Chinese and American crawfish; so you have to read the labels. You wouldn’t think that to be true with such a “Cajun”-typical name; but I was fooled once. Not again! Enjoy! It is a delicious recipe. I have a similar recipe and I use creamed style corn! Love this. I learned how to make it by tasting the product made by Best Foods which I purchased at Walmart. Thanks! This is one of my favorite crawfish recipes, too. If I buy frozen crawfish tails, do I also use the fat in the package? Do I need to cook the tails before adding it to the casserole? Hello, I use the fat in the package. It adds flavor — shouldn’t be an excessive amount of fat in the package. No, you don’t have to cook the tails first. This casserole is baked long enough to cook the crawfish. Some brands of crawfish are partially cooked, others not. Enjoy! Make it in a greased and preheated cookie tray for more crispy edges. Then cut in squares with a pizza cutter or knife after it cools a bit. Delish. Great idea. I am guessing this will come out more like cornbread than a casserole. Anyway. Delicious. Sounds delicious just what I wanted,. I cannot wait to make this. It sounds so good. We tried making this recipe and it did not firm up. After closer review, the recipe calls for one 8oz box Jiffy Cornbread mix OR two cups of the family size Martha White cornbread mix. 8 oz is 1 cup and 16oz is 2 cups. We used the jiffy mix and this is why it didn’t firm up. Regardless of what brand cornmeal mix you choose, the measurement should be the same. In order for this to firm up as shown in the photos, 2 cups Martha White or 2 8 ounce boxes of Jiffy cornbread mix in what is required. Want others to avoid wasting $30 on ingredients and the recipe not turning out. Thanks for your comments and for pointing out this discrepancy. I have changed the ingredients to show 2 cups of the Martha White Cornbread Mix and deleted the reference to Jiffy Cornbread Mix. However, please note that I titled the recipe “Crawfish Cornbread Casserole.” With all the extra ingredients, it does not cut like a slice of cornbread — I found the consistency to be more like a casserole — as you can see from the photos. I am so sorry that your recipe didn’t meet your expectations. Thanks for your recipe feedback. Want to make casserole. Don’t have Martha White. How can two Martha be the same as one Jiffy? 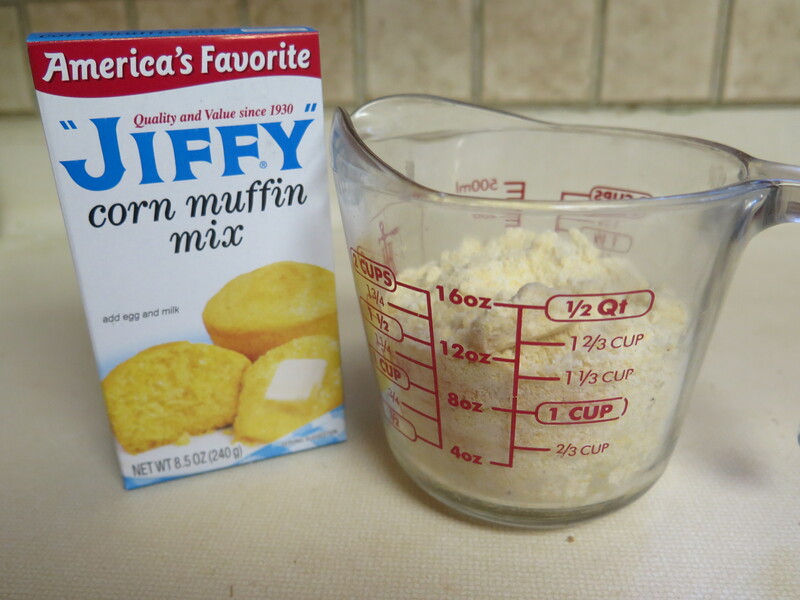 Hello, If you don’t have Martha White brand, Jiffy brand (8.5 oz box) of corn muffin mix will work just fine. Made it today. Baked for entire 45 minutes using a heavy cast iron skillet. After you remove casserole from oven, let it set for at about 15 – 20 minutes to “firm up.” It is a very moist casserole,; the key is to let it set for about 20 minutes so it is easier to cut and firmer. If you don’t have a cast iron skillet, a baking pan will work; may need to cook it a little longer. Hope you enjoy the recipe. And one Jiffy (8.5 oz) box by weight, measures 1-1/2 cups by volume. It is not equal to 2 Martha White boxes — it is intended to say that you use only part (2 cups) of one family size Martha White box. Anyway, one Jiffy box worked just fine. Hello, tried out my recipe again using a Jiffy (8.5 oz) box of corn meal muffin mix. I think that the key is let the casserole set for about 15- 20 minutes after removing from oven.. Then it will “set up.” It is still a very moist casserole. As to the discrepancy in measures — dry ingredients are measured by weighting — as they should be — so the Jiffy Mix box weights 8.5 oz. Measuring cups are really for liquid ingredients or volume — many cooks don’t have a kitchen scale, so I list things by volume, too (or measuring cups). The Jiffy Mix is 1-1/2 cups in a measuring cup. Either 1 box Jiffy Mix or 2 cups .out of a box of Martha White should work. Anyway, I am so sorry for your disappointment in the recipe. Ad a little bit of liquid Louisiana crawfish boil to your frozen crawfish tails to bring back the flavor. I do this to mine when I make my crawfish etouffee also only by your tails that are from Louisiana. Hello, That is a great tip — to season the crawfish tails — just a drop or two of crawfish boil is needed!!! — go lightly here — and yes, by all means purchase only crawfish raised in Louisiana!!! Your recipes should so good, got to try them!! My husband & I were born in Mississippi but lived & raised our family in Louisiana 40+ years!! Love Louisiana cooking!! Thank You! Enjoy the recipe; please share. It is crawfish season, now, the prices have been very high this spring in Louisiana; hopefully with this warmer weather the prices will start to drop! NO, NO, you cannot just substitute plain cornmeal for the cornbread mix. The cornbread bread & muffin mix also contains baking soda, shortening, sugar and salt. The baking soda makes the cornbread casserole “rise.” Omitting it and you will have a very flat casserole. It doesn’t really matter what brand of cornmeal bread & muffin mix you use but it should be about an 8 oz box. We used the mix primarily for convenience but you can also make your own from scratch. Substitute 2 cups yellow cornmeal, 2 tsp baking soda and 1/2 tsp salt (can be omitted). Stir these ingredients together and add. I have to say, I haven’t actually tried this, but it should work. Stay tuned, I’ll try it this weekend when I’m off of work and re-post my results. Tried it this weekend; suggest using 1-1/2 cups yellow cornmeal, 2 tsp baking soda and 1/2 tsp salt in place of the cornbread mix. I’d really like to make it without the “sweet cornbread mix”. What substitutions should I make in order to make it less sweet? Hello John, You can substitute 1-1/2 to 2 cups yellow cornmeal, 2 tsp baking soda and 1/2 tsp salt in place of the commercial cornbread & muffin mixes. Use 1-1/2 cups cornmeal if you want a moister casserole and increase to 2 cups if you really want a dish that is more like cornbread. Combine the cornmeal, baking soda and salt well in a small bowl before adding to other ingredients. Any brand of yellow cornmeal, such as Aunt Jemima® Yellow Corn Meal, should work. I made the casserole last night using 2 lb Jimmy Dean Sausage (cooked the sausage first) and it came out great! Cooked sausage cornbread casserole for only 30 minutes but definitely recommend cooking crawfish cornbread casserole for full 45 minutes. Let casserole “rest” for at least 20 minutes after removing from oven to “firm up”. Enjoy! Hello Denise, You could just omit the cheese — it is only 1 cup cheese and this makes a very large casserole — the main flavors of the casserole are all the vegetables, cornmeal and crawfish. Enjoy! Made your Craw-fish Cornbread Casserole last night. My husband had purchased a 4lb bag of frozen craw-fish at the store and we had some left so tried this recipe. OMG we could not stop eating it … How ever I did omit all the hot seasoning just because my husband does not like hot seasoning:( and I miss read the directions and used 2 pkg of Martha White sweet cornbread mix packages, oops, but it was perfect, Cooked in a iron skillet heated in the oven with a generous amount of oil , I also had some extra mixture and put it in 6 muffins and they came out perfect as well, just took them out a little before the iron skillet, they all browned up beautifully. Had added some butter to the first muffin but it did not need it at all, perfect just the was it is. So happy with this recipe, Thank you so much and this is definitely a keeper in my recipe book. Can’t wait to try it with shrimp or crab-meat or the sausage. Thank you again. Hello, Glad to hear you enjoyed the recipe! Yes, it is a flexible and forgiving recipe — you can remove the spicy seasoning and it still tastes good! I have discovered that there are different sizes of Martha White Cornbread Mix — that has confused alot of folks. If you are using the 6 oz packages, then you could use 2 packages — as you found — and it should be fine. If you are using the very large family boxes — the 2 cups mix is all you need. Also, if you are using shrimp, I’d use very small shrimp; sausage needs to be browned first – from 1 to 2 lb. I used 1 lb sausage, but the casserole could easily be made with more sausage. Crab-meat is very expensive in our part of the world — I might find some other recipes for it, actually. Thank you for the reply and answers, that is very helpful. I did use 2 of the 7oz pkg of the Martha White Sweet cornbread mix and like I said it was perfect. I really wouldn’t change a thing. Looking forward to trying the shrimp next Do you think the already boiled shrimp packages for shrimp cocktail would work or do I need to use the fresh shrimp? I always used frozen, raw peeled shrimp — small ones (71 -90 ct) — defrost them. These would need to be sauteed in some margarine or oil before adding to the casserole. The boiled shrimp for shrimp cocktail would work, too — although I have not seen these sold separately. Since they are already cooked, they could just be added to the casserole as is. Prepared this last night and it is wonderful. I did add more seasoning to make it a bit spicier. Everyone loved it. Hello, So glad to hear that you enjoyed the casserole. Thanks for the feedback!